Heat the oven to 400° F. Open the pizza crust package. The dough will have the shape of a rectangle, but you would prefer it to be round simply place it on the round pizza mold and reshape it. Bake the dough for about 8 minutes or until it has browned. Add the meat to a saucepan and cook for 7 minutes, and flip frequently. Remove from the pan. Add the cheeses to the dough. Add the pepper, olives and the rest of the ingredients. Bake the pizza for 10 to 12 more minutes or until the cheeses have melted and the dough is golden brown. You can add more cheese if you like. You can use your favorite combination of ingredients. Pizza is one of those dishes that can be found in nearly every corner of the world. Everyone loves pizza, from kids to adults. There exists a great variety of pizza and topping combinations that can be adapted to anyone's taste. 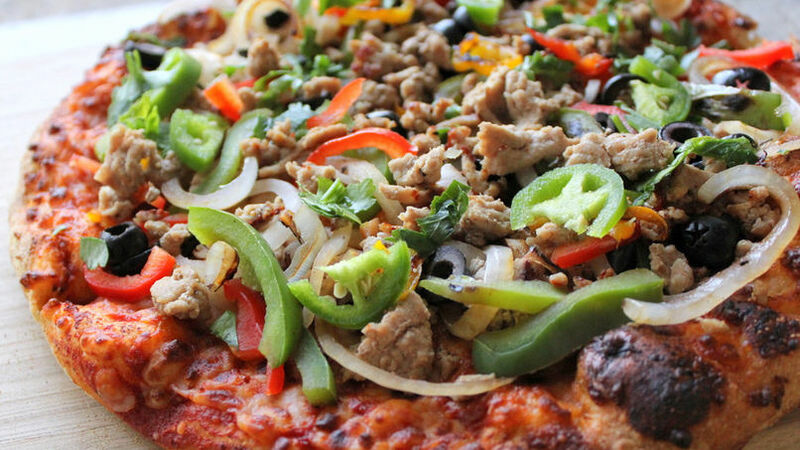 I like my pizza with a Latin twist, filled with fresh ingredients and flavor. This is one of my favorites.